FairBoost BV is using general terms and conditions, these apply to all quotations, offers and orders. You can download our general terms and conditions here. GENERAL TERMS AND CONDITIONS FAIRBOOST B.V.
- Remote Agreement: An agreement concluded between the Client and the Contractor in the context of an organized remote selling system of Goods, Digital Content and / or Services, until or until the conclusion of the agreement is solely or co-utilized by one or More Remote Communication Techniques. Within Remote Distribution, is included (as well) by the Customer in the Buyer's Webshop and Orders accepted by the Contractor. 1.2. The Contractor is entitled to subcontract a subcontractor in execution of the Agreement and / or to transfer (part of) her rights and obligations to the third party to the Agreement. The Contractor is also entitled to sell, transfer or pledge his claims on payment of compensation to a third party. 1.3. Client will never sell, transfer or pledge the rights and obligations based which he has, based on the agreement, to a third party. 1.4. FairBoost BV is using general terms and conditions, these apply to all quotations, offers and closed orders between Client and Contractor. In addition to our general terms and conditions also the ‘Nederland ICT Voorwaarden’ (as deposited by the Chamber of Commerce, number 30174840) are applicable on all ICT- goods and services (i.e. in the field of IT, SaaS-solutions, office technology and (the development of) software and websites. 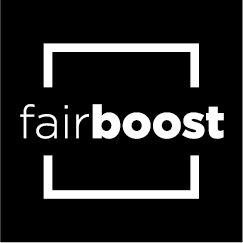 In contravention by cumulative application of the terms, FairBoost BV general terms and conditions prevail the ‘Nederland ICT Voorwaarden’. 1.5. Deviations or additions to these terms and conditions are only valid if confirmed instantly by the Contractor in writing and expressly and only for that agreement. Subject to express acceptance, any terms used by the other party will never apply. 1.6. If any provision of these Terms and Conditions is null and void, is destroyed or otherwise declared null and void, the remaining provisions of these General Terms shall remain unaffected and fully in force. Contractor and Client will agree a replacement in place of the null and void, destroyed or unapproved provision, with as much as possible observing the purpose and scope of the null and void, destroyed or out of application clause. 1.7. User reserves the right to amend or supplement these General Terms and Conditions. Applicable is the latest version supplied to the Client. 2.1 All offers made by the Contractor are without obligation, unless expressly agreed otherwise. All information in the publication / promotional material is subject to change without notice. The Contractor is not being held responsible for the correctness, completeness or actuality of those duties. For catalogs and further pre-printed information or mistakes contained therein, the Client cannot make any claim. The Client stands for the accuracy of the information provided by him on which the Contractor has based his offer. 2.2 The Agreement will only come into effect when confirmed by the Contractor or as soon as performance of the Agreement begins. 2.4 If and to the extent that the agreement concluded between the parties is a duration Agreement, the Agreement is entered for the agreed duration, in the absence of, one year's duration applies. 2.5 The duration of the Agreement will be renewed tacitly for the duration of the original agreed period, unless the customer or supplier terminates the Agreement in writing in accordance with a notice period of three months before the end of the relevant period. 3.1 Contractor shall comply with agreed or agreed terms of delivery to the best of their ability. 3.2 Unless explicitly agreed otherwise, the term of delivery will never be valid as a fatal deadline. They apply as target dates, do not bind the Contractor and have an indicative character. In the case of non-timely execution of the contract, the Client will provide the Contractor a reasonable time limit in writing. 3.3 Information to be provided by the Client, such as drawings, schedules, logo calculations and all other information necessary for the execution of the work, must always be received complete by the Contractor in full and properly form and to the possession of the Contractor. 3.4 Client will approve all drawings, calculations and other information submitted by the Contractor for approval to the Client, as soon as possible, but within 2 weeks. Upon completion of the aforementioned period without express disapproval, the Client shall be deemed to have granted tacit approval. Any drawings, calculations, designs, and / or other information approved by the Client will never be able to give rise to any attributable defects by the Contractor. 3.5 If the performance of the Agreement is delayed due to a circumstance that is impute to the Client, including the situation that the Client fails with the timely, complete and / or correct delivery of the information referred to in article 3.3 or in article 3.4, the Contractor is entitled to suspend execution of the agreement until the Client has yet provided or has given approval. All additional costs incurred as a consequence of the delay attributable to the Client and will be invoiced to the Client (including the costs of performing overtime, emergency orders, etc.). 4.1 The agreed price is excluding sales tax and other charges which are or are imposed by public authorities and are based on the price-fixing factors known at the time of the offer or the conclusion of the Agreement, including assembly and disassembly, on normal working days and hours and excluding overtime and weekend allowance. The Contractor is entitled at any time to calculate interim price increases, including those in raw materials, forms of production, labor costs and any additional costs incurred by the Client. All charges and taxes from government and any increases thereof may also continue to be carried out by the Contractor. 4.2 The Client may not deduct any rights or expectations from a Contractor or Agreement issued by the Contractor, unless parties have agreed otherwise in writing. An available budget announced by the Client to the Contractor will only be considered as a fixed price agreed between the parties for the performance to be performed by the Contractor, if expressly agreed in writing. 4.3 If, in accordance with the agreement between the Client, the Client consists of several natural persons and / or legal entities, each of the (legal) persons in relation to the Contractor is jointly bound to comply with the agreement. 4.4 In regard to the particular nature of the Contractor's business activities and in particular its short-term character, payment for agreements other than remote agreements (see Article 4.5) must be made in advance in cash or at the Contractor's choice on invoice and in the latter case 50% on order and within eight (8) days after the invoice date and 50% upon delivery and within fourteen (14) days after the invoice date. The Contractor is always entitled to request for prepayment all or part of the order. Discounts, deductions or settlements are not allowed by the Contractor subject to written consent. Payment must be made on the bank account designated by the Contractor. Charges related to payment will be borne by the Client. 4.5 For remote Agreements, the entire price must be paid at the time of placing the order. Contractor may, by way of derogation from the previous sentence, grant a payment deadline. Payment period is 14 days maximum. If the payment period has expired without the Client having fulfilled its payment obligation, the order will expire and the agreement will be deemed to not have been established. Discounts, deductions or settlements are not allowed by the Contractor, subject to written consent. Payment must be made on the bank account designated by the Contractor. Charges related to payment will be borne by the Client. 4.6 Payments will initially include cancellation of interest and collection costs and subsequent discharge of the longest invoice, even if the Client states that the payment relates to another invoice. 4.7 When the Agreement is being executed in sections, each partial execution is deemed to be a separate assignment and charged as such. 4.8 If the Client is not able to pay in time, , without notice to the Contractor, the Client shall be subject to a delay interest equally to the statutory interest, calculated from the date of expiry of the invoice, a part of a month equals a full month. Also, the Client is owed an extrajudicial collection fee, which is hereby fixed at 15% of the due sum with a minimum of € 300, - excluding VAT and without prejudice to the Contractor's right to reimburse the actual costs, whichever is higher . 4.9 The claim to the Client shall be paid immediately and in full, also increased by interest and costs as reported in article 4.8, in the event of another attributable shortcoming by the Client, or confiscation of his goods by requesting a client's bankruptcy. The Client is then deemed to be in default, irrespective of past term agreements. 4.10 In the case of non-timely payment and / or security statement as referred to in article 4.11, the Contractor has the right to suspend the execution of the agreement, or to dissolve, in whole or in part, without being held liable for any damages. All additional costs incurred as a consequence of the delay attributable to the Client will be borne by the Client (including the costs of performing overtime, emergency orders, etc.). 4.11 Regardless of the agreed payment condition, the Client is always obliged to provide sufficient security at the Contractor's first request. If the required security statement is not fulfilled within the stipulated period, the Contractor is authorized to dissolve the Agreement without being liable to any damages to the Client. 5.1 Contractor will take into account the best interests of the client in the performance of the agreement with the instructions and interests of the Client. The Contractor ensures that the Service (s) and / or Goods to be manufactured by it will comply with the Agreement and, in addition, to reasonable requirements of usability and validity. 5.2 Contractor determines the manner in which the Agreement is executed. The Contractor also has the right to perform certain activities without prior notice to the Client by third parties. Unless otherwise agreed, Contractor shall terminate agreements with third parties in connection with the performance of the Agreement at the expense and risk of the Client, for which the Client hereby grants and gives power to the Contractor. 5.3 Contractor will take the necessary care when selecting these third parties, but cannot be held liable for any failure to comply with the performance of the Agreement in so far as such shortcoming is in a third party's performance. The Client indemnifies the Contractor and its staff for all third party claims for costs, damages and the like in connection with the Contractor's performance of the Agreement. 5.4 Contractor is authorized - If the agreed Service (s) or (Concept) Goods are (temporarily) undeliverable, to provide a (substitute) Service and / or Goods. For the performance of the Agreement, the Contractor is entitled to replace the staff employed by other qualified personnel. 5.5 The Contractor will never be bound to provide the Customer with a further guarantee than the guarantee provided by any third party as referred to in Article 5.3. No warranty is provided by the Contractor on the information or materials provided by the Client, constructions prescribed by the Client, or by the Client or on behalf of her by any other than Contractor. 5.6 Contractor is not responsible for the consequences of errors and defects in materials delivered, or for defects in the Service (s) and / or Goods delivered as a result of normal wear and tear, improper, negligent or improper use by the Client or that are the result of changes made by the Client to the stand. Slight deviations in size, patterns, materials, colors and the like can never be the result of disapproval of Service (s) and / or Goods provided by the Contractor nor any price adjustment. 5.7 If deemed necessary for the performance of a remote agreement, the Contractor will, in writing, inform the Client about the manner in which the Client performs his obligations under the law on the protection of personal data. The Client ensures the Contractor that the content, use and / or processing of the data is not illegal and does not infringe any third party's right. The Client indemnifies the Contractor against any claim by a third party for any reason whatsoever in connection with this information or the performance of the Agreement. 6.1 Subject to further or deviant conditions, the Goods risk is transferred from the Contractor to the Client at the time of delivery. Delivery is understood to mean the moment when the Goods have been placed in the Client's actual power of attorney or to an employee of the Client. 6.2 Unless otherwise agreed, all Goods are delivered "Factory Location Contractor, Netherlands", excluding packaging. The Contractor is entitled at all times to deliver the Goods partially. 6.4 All Goods Delivered by the Contractor remain the property of the Contractor until the Client has fulfilled his obligations under the relevant Agreement and any previous similar agreements. Until the time when the property has been transferred to the Client in accordance with clause 6.3, the Client shall not be entitled to any act which impedes or impedes unauthorized exercise of the Contractor's proprietary right, including remaining unpaid Goods to third parties, unless otherwise agreed and subject to delivery within the normal business operation of the Client. 6.5 If the Client fails to comply with his obligations or there are reasons to assume that the Client will fail, the Contractor shall be entitled to take back the Goods delivered under title, without any credit. The Client will ensure that the Contractor will at all times have free access to the Goods delivered under the reservation of title, wherever that may be. 7.1 The client is obliged to thoroughly inspect the Service (s) and / or Goods delivered by the Contractor immediately after the delivery. The same applies to other or further services provided by the Contractor. Any complaints should be reported to the Contractor within a period of 12 hours after delivery / delivery to the Contractor, in accordance with a written and detailed decision to the Contractor, with due time of expiry of any recourse or claim. 7.2 Deviations of weight or quantity, as well directly visible damage, also in the packaging, must be mentioned immediately on any transport document, in the absence of which the client cannot take any action against the Contractor. The Client has the burden of proof that the items that he complains about are the same as those supplied by the Contractor. If the Goods have changed, have been completely or partially processed, damaged or packed, any right to complain will expire. 7.3 Slight deviations or defects in a part of the delivered will never constitute grounds for the Client to refuse or dismiss the relevant Service (s) or Goods or the Agreement. Complaints of any kind, never suspend the payment obligation of the Client. 7.4 Complaints and remarks about invoices must be reported in writing within 8 days of the invoice date. 7.5 In the event that a complaint is well-found by the Contractor, the Contractor will be obliged to best capability replace the relevant Service(s) or Goods, or to terminate the Agreement, with the refund of any amounts received. 7.6 Upon expiry of the period or after commissioning, the Client is deemed to have approved the delivered goods and service(s) and therefore the invoice. Complaints will no longer be processed. 7.7 Reporting of a complaint does not suspend the Client's payment obligation. 8.1 If an event occurring or not foreseen which the Contractor and / or its third parties is engaged in, in the performance of the Agreement reasonably have no effect on which the implementation of the Agreement is hampered, delayed or impeded ("Force Majeure") At the Contractor's choice, the execution of an Agreement is suspended for a period at least equal to the period of force majeure or the Agreement is terminated by means of a written declaration stating the condition which - further execution prevented. In that case, there will be no liability for damages, except for the Client's reimbursement of the costs actually incurred by the Contractor. In case of temporary or permanent impossibility of compliance by Force Majeure, the Client does not have the right to suspend payment. 8.2 If the Contractor, at the onset of Force Majeure, already has partially fulfilled its obligations under any Agreement or is able to fulfill its obligations only partially, the Contractor is entitled to invoice separately the part already completed. The Contractor is then held to agree that invoice as if it were a separate agreement. 8.3 A situation of force majeure will arise if the execution of the agreement is prevented by war, riot, molestation, fire, water damage, flooding, employment strikes, company occupation, import and export barriers, government measures, machine failures, disturbances in the supply of energy, interference of the Internet, data network or telecommunications facilities, third-party supplies and / or transport difficulties, requirements imposed by exhibition organizers and operators, utilities and government agencies, cancellations, altered construction and / or stock exchange data, exclusions and / or restrictions, or any other circumstance beyond the reasonable influence of the Contractor. 9.1 The liability of the Contractor is limited to compliance with the warranty obligations referred to in Article 5 and, in the event of intentional gross negligence or gross negligence, any liability of the Contractor for any costs, damages (including personal or casualties) or otherwise is excluded unless arising from legal provisions of compulsory law. 9.2 Without prejudice to the provisions of the other members of this article, the total liability of the Contractor - for whatever reason or on any legal basis - expressly encompasses any failure to comply with a liability obligation agreed with the Client, limited to remuneration of direct damage up to the amount of the price stated for that agreement (excluding VAT). If the Agreement is mainly a duration Agreement with a term of more than one year, the price stipulated for that Agreement will be calculated on the total of the fees (excluding VAT) for one year. In no event shall the total liability of the Contractor for direct damage, on any legal basis, however exceed the insured amount, insofar as the damage is covered and the insurance becomes payable. 9.3 In no event shall the Contractor, be liable for indirect damage, intangible loss or consequential loss, including loss of business or loss of profits, without prejudice to the provisions of the other members of this Article. 9.4 No liability is accepted by the Contractor, resulting from overruns of delivery times, inadequate cooperation by the Client, inadequacy of third party supplies, force majeure or acts or omissions (including improper or instructional misuse of the delivered) of the Client, or his subordinates or employees of the Client. 9.5 Client indemnifies Contractor for all claims of third parties arising out of, arising out of or relating to (execution) of the Agreement unless Contractor is liable to the Client under any terms of the Agreement or these terms and conditions. 9.6 Contractor is not responsible for any deviations from the Agreement, for which this approval has been granted, upon delivery and approval by the Client of the delivered. 9.7 The Contractor expressly excludes any liability for errors of any kind arising from telephone notices and orders. 9.8 The Contractor is in charge of the usual standard quality and reliability of the delivered goods; Its actual life-span can never be guaranteed. 9.9 If the Contractor supersedes parts of the warranty obligation, the replacement parts will be owned by the Contractor. 9.10 The Contractor is solely liable for damage in accordance with the above stated up to five (5) years after delivery. 10.1 Unless otherwise agreed in writing, all intellectual property rights, including but not limited to, all drawings, calculations, designs, (technical) documentation, construction specifications, computer programs, as well as all carriers of those rights ("Intellectual Property Rights") Will remain the property of the Contractor at all times and all Intellectual Property Rights that will arise in the performance of the Agreement or related thereto shall be communicated to the Contractor. At the first request of the Contractor, the Client will take all necessary steps to ensure the transfer and / or registration of Intellectual Property Rights at Contractor's expense. 10.2 If, in derogation from the provisions of Article 10.1 of the Agreement, is agreed that Intellectual Property Rights will be communicated to the Client, the Contractor shall, at the same time, be obliged to provide the Contractor with a non-cancellable, exclusive, worldwide, royalty free and non- Transferable license for use, including the commercial exploitation of such intellectual property rights. In addition, the provisions of the previous sentence do not affect the right or possibility of the Contractor to determine the components, general principles, ideas, designs, documentation, works, standards and the like underlying such development without any limitation for other purposes To use and / or operate, either for themselves or for third parties. Nor does the transfer of an intellectual property right affect the Contractor's right to do for himself or third developments that are similar or derived from those which are or are being made for the benefit of a customer. 10.3 Contractor is required to indemnify the Client in respect of all third party claims in connection with Intellectual Property Rights. 11.1 Client and Contractor ensure that any information received from or otherwise reasonably known to the other party is kept confidential. This prohibition does not apply to the Contractor if and to the extent that disclosure of the relevant information is necessary to a third party by virtue of a court ruling, a legal provision or for the proper execution of the agreement by a supplier. The party receiving confidential information will only use it for the purpose for which it is provided. Data shall in any case be regarded as confidential if they are designated by one of the parties as such. 12.1 In all legal relationships with Contractor, the Dutch law of application is exclusive. The provisions of the Vienna Buying Convention are expressly excluded. 12.2 All differences arising from the legal relationship between the parties will be resolved initially and exclusively by the District Court in the Hague, unless the Contractor chooses the court under which the client is domiciled. 13.1 The Client fully complies expressly and unconditionally with the rules and regulations of the organizations and agencies in which the Contract is to be performed. The Client declares that the said organizations and entities are entitled to unilaterally reject the draft of the Statement and the Contractor will take the necessary steps to - but does not allow it - to adjust the position in order to approve it. to get. Any additional costs and / or delays incurred will be borne by the Client. The Employer also declares to comply with all rules and regulations of facilities providing organizations, including utilities and cleaning companies, while the client declares all costs associated with using the temporary position, including the costs of connection (including electricity boxes) and use of gas, water and electricity. The Client must pay the costs of such facilities separately and without charge directly to the suppliers of these services, unless otherwise agreed. 13.2 The client declares itself to behave orderly and carefully in relation to the organization where the fair or exhibition is held. 13.3 The work performed by the Contractor and the materials installed by it shall be deemed to have been delivered and accepted by the Client as soon as the Client has commenced the decoration of the stand. 13.4 The right of complaints (as referred to in Article 7) shall in any event cease to be available when the Client has premiered the position, made available to a third party, or made a personal change. Nor are its complaints against the Contractor admissible relating to the accommodation and facilities provided by third parties. 13.5 Contractor-related materials and parts of the condition that are not reused after disassembly of the stand and which are clearly remitted may only be used by the Client after the prior consent of the Contractor. 13.6 If, by the Contractor, either for consideration or for any particular Goods are transported for the status or establishment of the stand, the Contractor shall not accept any risk for theft, loss, damage, loss, etc. unless this is due to the intention or gross negligence of the Contractor. These issues are also not secured by the Contractor. Neither is the Contractor obliged to assure itself of the transport risk. If necessary, the Contractor shall provide a price quote to the Client in advance of this additional service. 13.7 In the event that the Contractor certain materials - whether or not in the context of orders - Contractor will never be liable for claims by the Client or third parties. These materials, which may be supplemented or removed by the Client, therefore remain in full for the sole account and risk of the Client at the Contractors’ warehouse. 13.8 In case the agreement relates to an event, including the entire course of a trade fair, the related business risks will remain entirely at the expense and risk of the Client. The Client will ensure and keep insured against those business risks, including cancellation and liability. The Client indemnifies the Contractor in respect of any claim by third parties. 13.9 The client is obliged to remove their belongings immediately after the exhibition has ended. Contractor is not liable for theft, loss and / or damage to property belonging to the Client, especially if the Client has not complied with the obligation mentioned in the first sentence of this article. The Contractor is entitled to dispose of, and save, Client owned property for the account and risk of the Client. The related costs will be paid by the Client in cash. 13.10 The Client will indemnify the Contractor in respect of all third party claims in connection with the obligations of the Client under the Agreement and the present General Terms (including, but not limited to, the obligations under this Article 12). 14.1 The following Articles 15 to 17 apply in addition to the above-mentioned articles in so far as there is a lease agreement, at least an agreement which also contains elements of rental. 14.2 In the event of a conflict between Articles 15 to 17 and the other provisions of these general terms, the aforementioned articles shall prevail. 15.1 The rental will commence on the agreed date or on the date of delivery of the rental items if no explicit commencement date has been agreed or when mutual agreement is agreed upon earlier than the agreed rental date. The term "delivery" refers to the actual posting of the rental items to the Client or when the Client started using the rental items. 15.2 The date of delivery and the return date by the Client or return by the Contractor are included in the rental period. However, if the rental items are returned by the Client within the agreed time, the rental fee will remain due for the entire agreed period. 15.3 If the fixed-term lease agreement has been concluded, it will be renewed tacitly after expiry of that period until termination of the contract. The contractor is always entitled to adjust the rental price from the renewal date to the level of the rental price at the time of extension at the Contractor. However. The Contractor reserves the right not to extend the lease agreement after the expiry of the agreed timeframe. 15.4 The rental fee is due and is charged by the Contractor for each exhibition period plus the days required for the completion of the exhibition or a different term agreed by the parties. The relevant invoice must be fulfilled by the Client, in accordance with Article 4.2. 15.5 Without prejudice to paragraph 3 of this article, the lease agreement shall terminate on the date on which the rental items are transferred by the Client to the Contractor in complete, undamaged and orderly condition or, as agreed, has been returned by the Contractor, in which case The Contractor or the third party supplier is obliged to be present immediately, but no later than 12 hours after the event for which the lease is used, to obtain the Rental items. 16.1 At the commencement of the rental period, the Contractor has the right to inspect the Rental items, the rental items are deemed to be in good condition, fully and delivered as agreed. If the Contractor supplies and installs the rental items by the Client, or at a location designated by the Client, it shall be deemed to be in good condition, fully and delivered as agreed, subject to written complaint by the Client within twelve hours after delivery and installation, or so much earlier If the event with the eye on which the rented will be used is taken. 16.2 Client will manage the Rental items carefully during the rental period. The rental items must be used solely in accordance with its nature and destination. All costs arising from defective or improper use or maintenance, damage and recovery, - for whatever cause or cause, - will be borne by the Client, subject to the provisions of Article 17. Reasonable repairs during the rental period will at all times be borne by the Client. 16.4 If the Client is to be seized or a bankruptcy is requested, the Client shall immediately notify the Contractor. The Contractor is entitled to provide the Rental Items with external identification, in order to make clear who is the proprietor. The contractor obliges the Client to keep such recognitions in a clearly visible condition and may never remove these signs. 16.5 Packaging materials made available by the Contractor remain at all times its property and must be used by the Client during transport of the Rental Items. 16.6 At the end of the rental period, the Rental items and any packaging material must be cleaned and returned in original condition. Any facilities and / or materials and / or property belonging to the Client must be removed. If the Client is in default of return in its original state, the Contractor will be entitled to charge the Client's cost of recovery. In case of return, the Client has the right to have the rental items investigated by an expert. Costs of repair or replacement will be made by the Client at the Contractor's first request on invoice, whereby the specified reparation note must to be submitted by the Contractor for providing compelling evidence. 17.1 During the entire rental period, the Client bears all risk of theft or loss and is liable for all damage and theft or loss of the Rental Items. In the event of theft or loss, the Client is obliged to compensate the rental item for new value. 17.3 In all cases, the Client is obliged to immediately notify in case of damage, theft or loss of the Rental Items to the Contractor. In the event that the Client is reasonably to assume that theft or deliberate damage has occurred, Report this to the police within 24 hours and to send the original declaration to the Contractor immediately.